The Messerschmitt Bf 110, called Me 110, was a twin-engine heavy fighter (Zerstörer - German for "Destroyer") in the service of the Luftwaffe during World War II. Hermann Göring was a proponent of the Bf 110, and nicknamed it his Eisenseiten ("Ironsides"). Development work on an improved type, the Me 210 that was to replace the Bf 110, begun before the war started, but due to teething troubles, resulted in Bf 110 soldiering on until the end of the war in various roles, alongside its replacements, the Me 210 and the Me 410. The Bf-110E was an upgraded D variant with more powerful engines and additional strengthening to allow it to carry more ordnance. It retailed the elongated tail of the D-3 version, though did away with the large fuel tanks. Thanks to the increased weight of the aircraft, it was the least liked version of the 110 and pilots who had flown earlier variants felt it was sluggish and unresponsive. 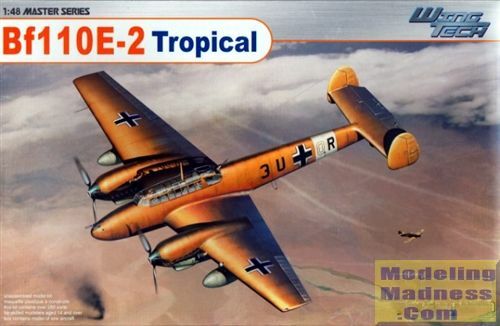 As with most Luftwaffe aircraft, there were tropicalized versions that had sand filters and larger cooler radiators as well as a survival kit. This has to be at least the fifth boxing of the Bf-110C/D/E series that Cyber-hobby has produced and I'm sure there are still others to come as they seem to concentrate on sub-variants for their boxings. The kit is not light on parts with over 280 bits listed on the box cover. 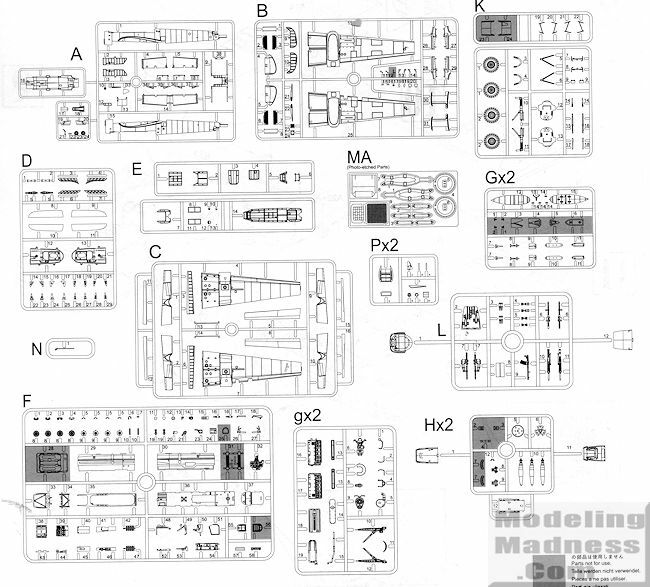 All that you have come to expect from Cyber-hobby is included in this kit. You get their excellent level of detailing and flash-free parts. The cockpit is very nicely detailed and thanks to photo etch, you get a harness for the pilot and GIB (guy in back). In fact, the gunner/radio opera tor's seat is also photo etch. A full radio suite as well as access to the lower fuselage forward firing guns is also part of the kit. A rear gun as spare ammunition cases are also provided. There is plenty of detail in the sidewalls as well. In fact, this kit is pretty much a scaled down version of their 1/32 kit, though with fewer tiny bits. The canopy sections can be built either open or closed and you get an optional armored windscreen. Another feature carried over from the 1/32 kit are two complete engines with removable cowlings. You also get separate flight control surfaces and they, along with the flaps, can be posed in positions other than neutral. Slats are also separate items. For things under wings you have a pair of bomb racks along with bombs to install in them and a pair of fuel tanks inboard of that. The mounting holes are filled in so you'll have to open up the ones you want to use prior to assembling the wings, which will eventually fit on spars that are part of the fuselage assembly. While there is a center fuselage bomb rack in the parts, it is not part of the build. Check your references to see if the plane you are modeling has this feature or not before construction. Markings are provided for three planes, all in RLM 79 over RLM 78 and without mottling. They are all from ZG 26 so have the same code prefix of 3U. One is based in Italy with yellow engine cowlings and a white fuselage band with yellow lower wing tips and yellow rudder were based in North Africa with the box art plane having just a white fuselage band while the other has white engine cowlings and white lower wing tips. 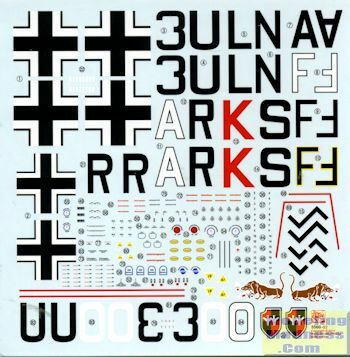 The decal sheet has markings for two planes not shown in the instructions. One is another RLM 79/78 plane coded 3U+KS with white fuselage band and lower wing tips. The other is in standard RLM 74/75/76 with heavy mottling coded LN+FR and has the daschund nose marking. I discovered this by googling the kit number. Perhaps these last two are not an E-2/trop, but the markings are on the sheet. So now we have another addition to cyber-hobby's growing 110 catalogue. It makes for a good option to those who are looking for an alternative to the Eduard kit which is apparently nearly impossible to model with the panels closed and has some dodgy fit. This one should alleviate those concerns and is less expensive to boot. It should make into a superb model of this important Luftwaffe aircraft. Now all we need is a 110B with the Jumos to complete the line.